Adult Day Programs encourage the active participation of frail seniors and handicapped persons in a variety of activities. These programs are beneficial to participants as well as caregivers in that they offer a break (respite) while providing health services, therapeutic services, and social activities for people with Alzheimer’s disease and related dementia, chronic illnesses, traumatic brain injuries, developmental disabilities, and other problems that increase their care needs. Some adult day care centers are dementia specific, providing services exclusively to that population. Other centers serve the broader population. Assisted living residences offer private or semi-private living quarters complemented by a variety of services that include meals, medication monitoring, transportation, and recreational activities. They provide assistance with bathing, dressing, and other activities of daily living. Some or all services may be available as part of the resident agreement or for an extra charge. This type of service offers the option of bringing care to an individual’s home. Typically routine chores, meal preparation, assistance with bathing/hygiene, and general upkeep of the home are services that are provided through companion care agencies. This assistance is billed on an hourly basis and when approved is covered by Medicaid via Medicaid participating agencies. Continuing Care Retirement Communities (CCRCs) are designed to offer active seniors an independent lifestyle from the privacy of their own home. The community offers them access to coordinated social activities, dining services and health care when and if the course of aging raises the need. It is sometimes referred to as Lifecare because of the opportunity for a continuum of care provided by or within one community. Elder Law is the area of law, statutes, regulations and decisions, which impact on the lives of older Americans and their families. Elder law spans and encompasses elder care planning issues, such as access to the appropriate type of medical and personal care, coordinating private and public resources to finance the cost of care, income assistance benefits, taxation, conservatorship, general estate planning, estate and trust administration issues (e.g., wills, trusts, and probate), counseling and planning for incapacity with medical directives, advanced directives and other alternative decision-making documents, as well as for possible long-term care planning issues, including home health care, nursing home care, hospice and respite care. Care designed to give supportive care to people in the final phase of a terminal illness and focus on comfort and quality of life, rather than cure. The goal is to enable patients to be comfortable and free of pain, so that they live each day as fully as possible. Aggressive methods of pain control may be used. Hospice programs generally are home-based, but they sometimes provide services away from home — in freestanding facilities, in nursing homes, or within hospitals. The philosophy of hospice is to provide support for the patient’s emotional, social, and spiritual needs as well as medical symptoms as part of treating the whole person. These communities are designed to provide a complete lifestyle for those of retirement age. They offer private living facilities with support services ranging from meals, health care monitoring, transportation, linen services, house cleaning, as well as educational and entertainment services. These response systems provide access to help 24 hours a day. The systems are easy to use and designed to reduce the risk of living alone. In the event of a fall or an emergency, help is available at the push of a button. In most cases money management services provides a wide range of services for seniors and other incapacitated adults including financial power of attorney, conservatorships, personal representative, and trustee. A living arrangement in a residential home in which people with special needs, especially older people with disabilities, reside in a facility that provides help with everyday tasks such as bathing, dressing, and taking medication. These types of communities adhere to the same State Health Department Regulations as assisted living communities. 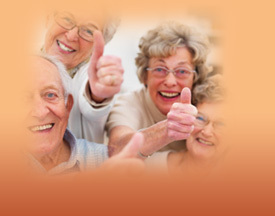 These professionals assist individuals 62 or older in obtaining a reverse mortgage. This is a special type of loan that allows seniors to utilize a portion of the equity in their home and receive tax-free money, monthly income and/or credit line. The U.S. government guarantees the reverse mortgages. A reverse mortgage provides financial security because individuals do not have to make payments or repay the loan as long as they occupy the home as a primary residence. Moving is stressful for anyone, but older adults may be overwhelmed when leaving a beloved family home, unable to cope with the task of sorting and disposing of decades worth of belongings. Senior Move Managers are professionals who specialize in assisting older adults and their families with the emotional and physical aspects of relocation. Typically this service is billed by the hour. Senior Real Estate Specialist is a designation for Realtors to address the needs of home buyers/sellers age 50-plus. By earning this designation, a realtor has demonstrated necessary knowledge and expertise to counsel clients’ age 50-plus through major financial and lifestyle transitions involved in relocating, refinancing, or selling the family home. Skilled home health is the provision of intermittent skilled services to a member in the home for the purpose of restoring and maintaining his or her maximal level of function and health. These services are rendered in lieu of hospitalization, confinement in an extended care facility, or going outside of the home for the service. Nursing homes provide twenty-four hour custodial and/or rehabilitative nursing care, activities, as well as social services. Many communities offer programs specifically designed for Dementia, MS, or Mental Health diagnosis. The rehabilitative services offered at many nursing homes provide individuals with physical, occupational, and speech therapy. These communities are designed to provide low cost housing for the disabled and elderly. Typically housing is the only thing that is offered. However some may offer transportation as well as recreation and support services. Residents in subsidized facilities are normally expected to pay one third of their monthly income.